In launching a new journal we are quite conscious of the doubt over whether a need exists for “another” academic journal. In a sense, however, the times and the currents of thought have genuinely changed recently, and journals whose missions reflect a former time are slow to make the adjustment. The Pluralist is, therefore, in the van of something really quite new in philosophy. I will explain this in some detail in my essay for this first volume, but what is called for here is an account of this journal and its reasons for existing. The Pluralist, while it is a new journal, is also a continuation and expansion of the mission of its predecessor. The Personalist Forum was founded in 1985 by Thomas O. Buford of Furman University. Historically there had been two major journals serving the personalist philosophical enterprise in America: The Personalist, founded at the University of Southern California in 1920 by Ralph Tyler Flewelling, an influential student of Borden Parker Bowne, the latter being generally acknowledged as the founder of the Boston University school of personalism in American philosophy; and The Philosophical Forum, founded by a group of scholars that included Edgar Sheffield Brightman in 1943, published originally by Boston University. Brightman was also a student of Bowne. As the founders of these journals passed away, and as the philosophy profession became increasingly occupied with internecine disputes about language, the vital social role of these journals was gradually altered and finally reduced to insignificance, even as the journals themselves “flourished” in the purely academic sense. In 1980, The Personalist changed its name to Pacific Philosophical Quarterly, and devoted itself exclusively to analytical and logical philosophy. Some years earlier, The Philosophical Forum had moved away from Boston University to the City University of New York, becoming a general journal in philosophy, without an awareness of or focus upon its personalist roots. One feature that has been a mark of philosophical personalism all along is its refusal to become a purely academic viewpoint. In many ways personalism ceased being an academic viewpoint at almost the same time as it became a social movement. Two of the most important social movements of the second half of the twentieth century in the Western world were led by philosophical personalists, and here I speak of the Civil Rights movement in the U.S. (Martin Luther King, Jr., was a professed personalist) and the Solidarity movement in Poland (both Pope John Paul II and Lech Walesa being also personalists). In a sense, personalism has never been healthier than it presently is, but it has left the academy, becoming instead an applied philosophy. Yet, there is still so much to discuss in the way of the accompanying philosophy. Tom Buford recognized that the decline of the two historic organs of personalist philosophy left the academy without a clear voice in the tradition of Boston personalism, and he founded The Personalist Forum to fill that emerging gap. The young journal was published by Furman University for its first nine volumes. Due to Buford’s efforts, gradually the awareness and presence of the journal grew. It would be too much to say that the journal became “influential,” but it has been counted among the respected scholarly journals in philosophy and theology, and has published articles that do indeed continue to garner attention from the scholarly world. In method the journal was pluralistic from the beginning and has always published essays that followed any respectable philosophical methodology. In 1993 Mercer University Press took on the publication of the journal, and the journal grew still more. 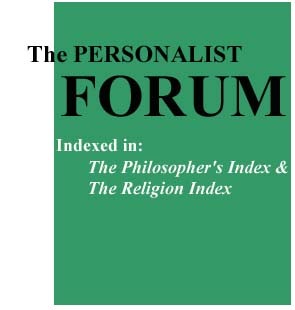 Buford succeeded in getting the journal indexed by The Philosopher’s Index, and in 1997 we began being listed in The Religion Index. Between 1993 and 1997 Mercer University Press did an excellent job with text-editing and in producing a high quality journal. In 1997 the founding editor decided that the time had come to pass the journal on to someone whom he believed understood its history and purpose, and who would maintain its personalist mission. He selected the present writer, who was at that time associate professor of philosophy and religion and director of the Institute of Liberal Arts at Oklahoma City University, thus ending the subsidy from Furman. Mercer University Press soon changed its focus and mission leaving its program in publishing philosophy aside. The Personalist Forum was published irregularly between 1997 and 2005, whenever funding could be secured for it, by Oklahoma City University. Many thanks are due to the persons who worked so very hard to keep The Personalist Forum going during these difficult years, especially to Oklahoma City University, Mark Y.A. Davies, now Dean of the Wimberly School of Religion there, and to its former Dean of Arts and Sciences, Leo G. Werneke. Yeoman’s duty was put in by James B. Sauer of St. Mary’s University, San Antonio, who managed the business affairs, and by the Editorial Board of the journal. A number of the Editorial Board members of this new journal are those who labored so much to keep The Personalist Forum going through its lean years. Our difficulties in finding a new publisher indicated to us the possibility of taking the journal in a new direction, and the suggestion of The Pluralist came from Scott Pratt of the University of Oregon, who was very much interested in the health and well being of the journal. It was an exciting idea, and one with great promise. In time we were able to interest University of Illinois Press and Oklahoma State Univesity in the idea, and the result lies before you now. In fact Bowne was one of a small group of people who gave birth to pluralism in the U.S. William James reports that Bowne and George Holmes Howison were both members of “a little philosophical club that used to meet every fortnight at [Thomas Davidson’s] rooms in Temple Street in Boston.”(2) Philosophical pluralism in the U.S. was almost surely born in these conversations of the 1870s among these philosophers, who were indeed pluralists even before they were personalists. It is possible that pluralism is what led each of them to personalism, but in any case we find in this a kind of historical endorsement to step back from our more specific focus upon personalism and into our broader history with pluralism. Apart from its continuity with The Personalist Forum, we also set out herewith on something we take to be relatively new territory in philosophy. I will explain in greater detail the sense in which “pluralism” is a positive commitment to a program that expresses a mature understanding of the genuine complexities of human experience and its philosophical expression. The co-editors of The Pluralist, John Shook and Scott Gelfand of Oklahoma State, will each express his own view of the pluralism in the next two issues. Each of them will be editing one issue per year according to his own conception. We will be dedicating Professor Gelfand’s issue each year to applied ethics, which is an aim especially congenial to our history and current mission. An examination of the past issues of The Personalist Forum will quickly reveal how much we have prized applied ethics. It is a privilege to have this carried forward as a defined part of our expanded mission, and the generous support of Oklahoma State University is deeply gratifying. The support of my home institution, Southern Illinois University, Carbondale, its Department of Philosophy, College of Liberal Arts, and the Provost John Dunn, has been indispensable to the project. Together the editors and the editorial board look forward to a long and fruitful collaboration in bringing to the philosophical world the constructive results of pluralistic enquiry. (1) Jean Wahl, The Pluralist Philosophies of England and America, trans. Fred Rothwell (London: Open Court, 1925), 319. (2) William James, “Thomas Davidson: Individualist,” in Essays, Comments and Reviews, eds. Frederick H. Burhardt, et al. (Cambridge, MA: Harvard University Press, 1987), 88-89.